« HUMBOLDT APPROVED: What is Humboldt’s Best Campground? UPDATE, 11:39 a.m.: A LoCO reader sent us a graphic picture he took of the scene. Be warned. 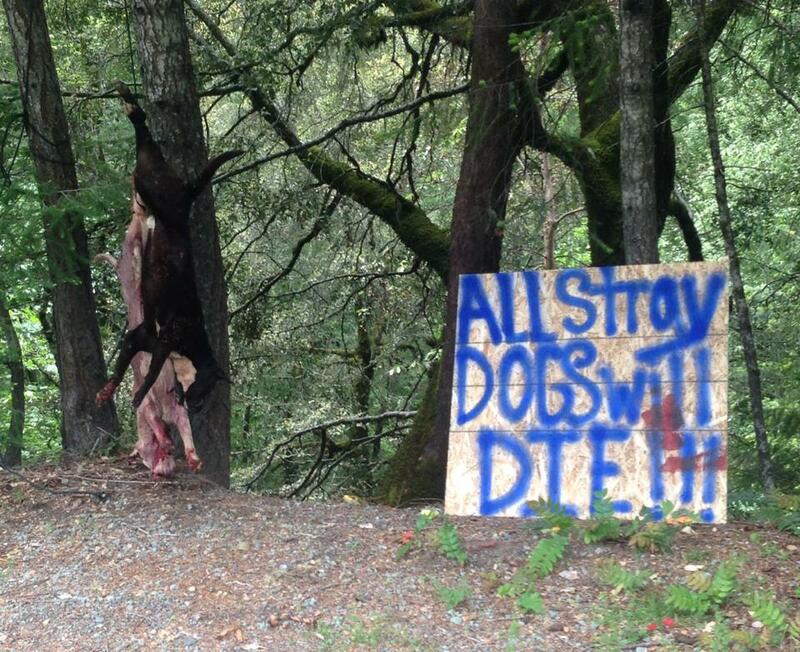 On 05-19-2014 at about 1:27 p.m. the Humboldt County Sheriff’s Office received a telephone call from a Caltrans employee, who reported finding two deceased dogs hanging by a rope, next to Highway 36 just west of Dinsmore. When the deputy arrived on scene he saw two adult size pit bull dogs, hanging from a rope by their rear legs from a tree. The two dogs were located on the east side of Highway 36 near mile post marker 38.62. The first dog was white in color and the second dog was brindle in color. It appeared that the two dogs had been shot in the head. There was a large sprayed painted wooden sign near the two deceased that read, “All stray dogs will die.” The Deputy cut down the two dogs from the tree. The area was checked for any possible witnesses with negative results. The closet residence to where the dogs were located on highway 36 was approximately ½ of a mile. The Sheriff’s Office is requesting the public’s help in identifying the suspect or suspects that are responsible for killing the two dogs. If anyone has information on this incident they are encouraged to call the Humboldt County Sheriff’s Office at 707-445-7251.